...he asks for some unique burp cloths! 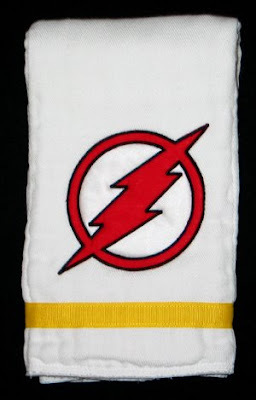 To refresh your memory, I digitized applique designs of four superhero emblems to make a ribbon blanket for Jason and Anna's son Torin. 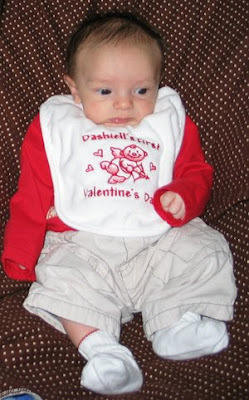 It was received with the enthusiasm I expected, and very quickly Jason requested burp cloths with those same designs. Jason wanted more, but with the holidays, impending birth of Dashiell, and then infanthood, he has patiently waited until now. 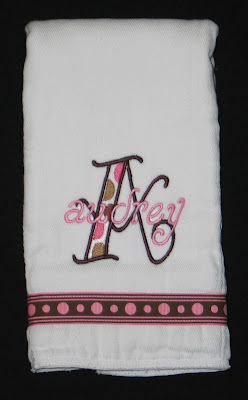 While the style of the last batch looked cool, Anna wasn't thrilled with the multiple fabric types on one burp cloth. 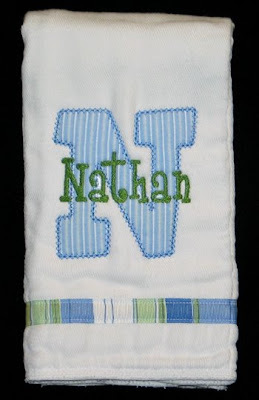 In an effort to please Mommy, Jason and I opted to put the emblems directly on the cloth diaper, and use ribbon to represent the dominant color of the costume. 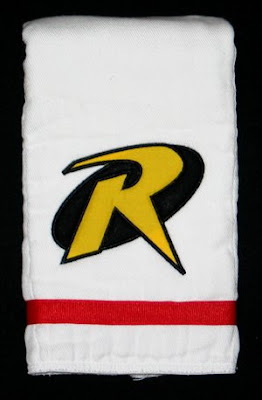 This burp cloth is not a superhero reference, but SciFi... Kathy digitized the text for me (TTF Papyrus) that I stitched on the ribbon. 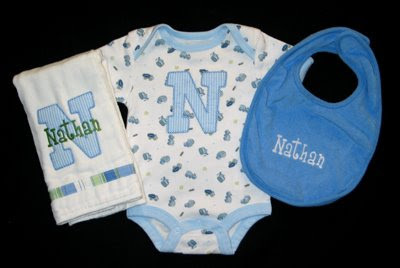 The applique N is from Embroidery Boutique's Fun Applique Alphabet. 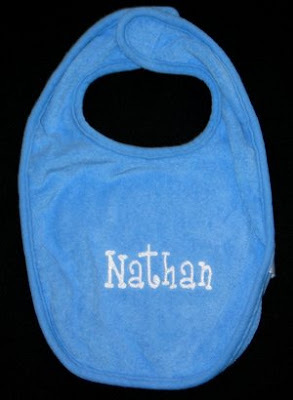 I used the Jason font from 8 Claws and a Paw for "Nathan". 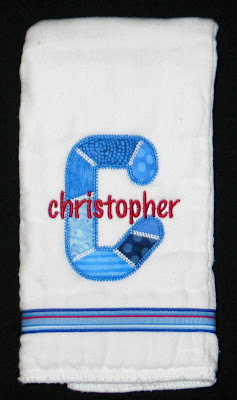 * Fuse Applique Fuse and Stick to the wrong side of the fabric that you will use as the applique'. 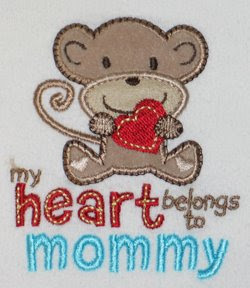 * Hoop that fabric and stitch the first outline onto it. 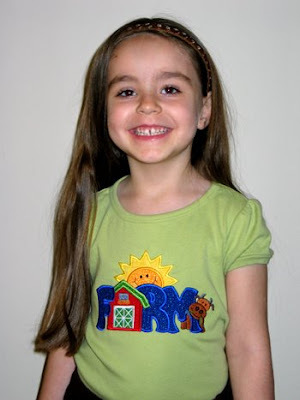 * Unhoop and trim the fabric close to the outline stitches. 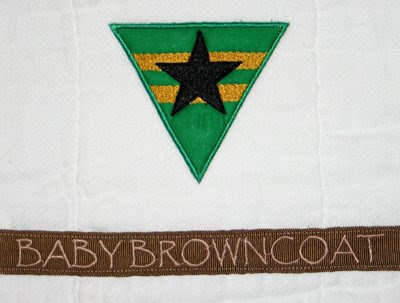 * Hoop the garment and stitch the next color which is the placement outline for the applique. 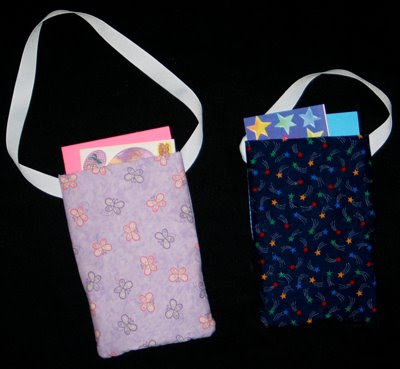 * Peel the paper liner from the applique to expose the adhesive. 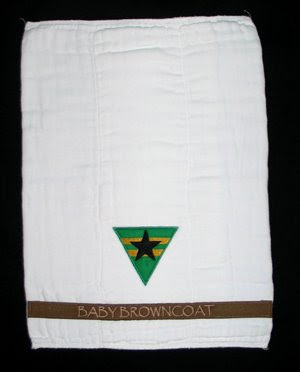 * Place the applique onto the garment matching and covering the placement outline. * Continue stitching the design. I was pleased with how successful I was with my first attempt! I won't use this method all the time for applique, but certainly with onesies and other little shirts that are more complicated to stitch on! 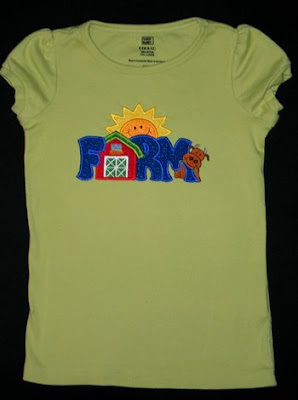 Sew Many Designs, I picked this cute FARM design. 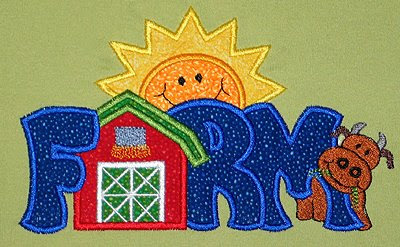 SMD applique designs take a while to stitch out (lots of fabric patches and detail) but they stitch flawlessly and are sooooooooo cute! I especially love her word designs that substitute items for letters (like the NOEL shirt I made in November). 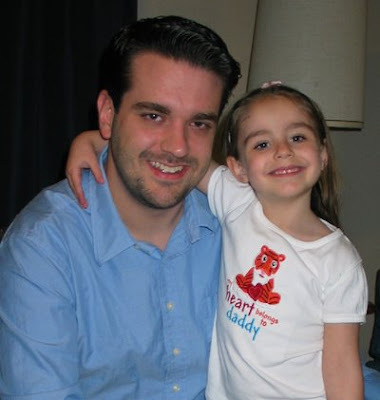 and me and my boy! This year I signed up to bring goody bags for Annaliese's class party, mainly because I had bought this cute Valentine bag design from Sewing for Sarah! 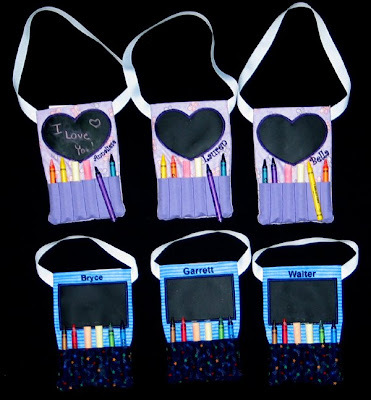 The front has a mini-chalkboard (vinyl chalkboard fabric) and slots for chalk and crayons. 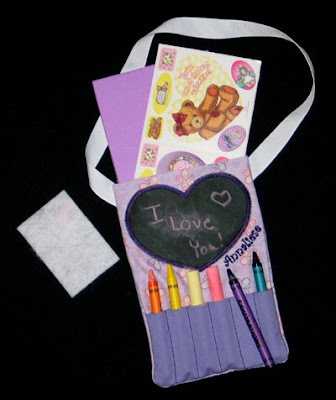 We filled the back pocket with a pad of paper, stickers, and a piece of felt to erase the chalkboard. 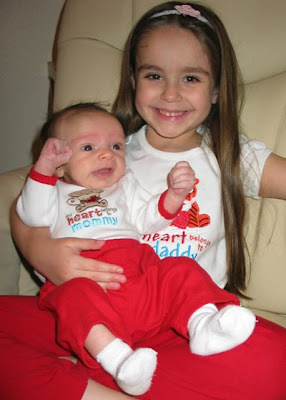 For the boys, I substituted an applique rectangle for the heart, I figured they would like that better. I personalized them all, as well. 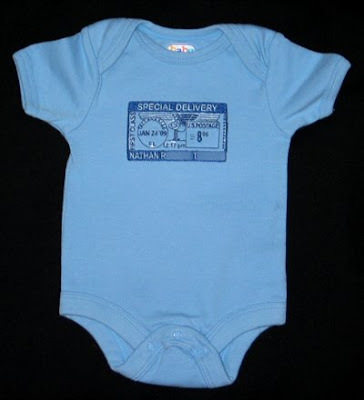 First she gave Paige a Special Delivery onesie gift certificate. 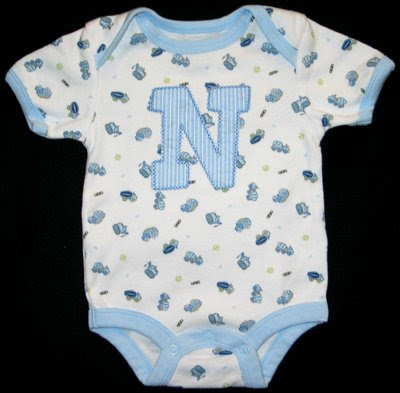 Nathan was born a couple weeks ago, and I've gotten his onesie stitched. 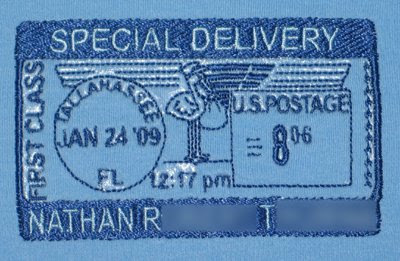 The design is from Sew Terific. 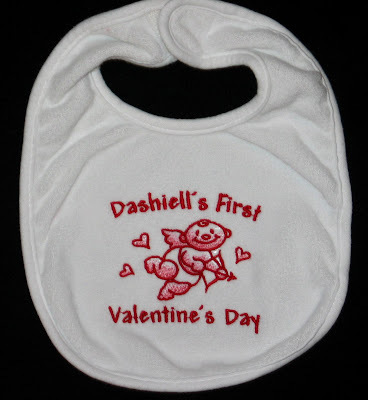 Michelle also ordered this bib/burp cloth set for Tracy who is expecting a baby girl. 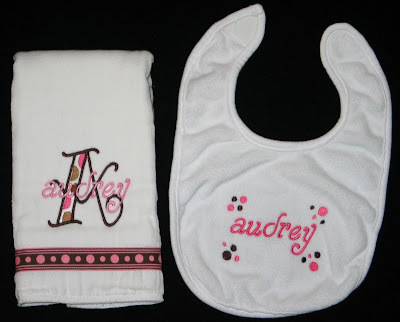 The monogram on the burp cloth is Whimsy Dots by Five Star Fonts. 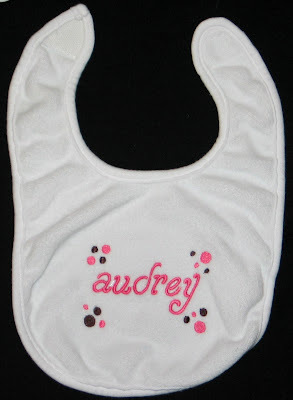 For the bib, I used the same font for Audrey's name, and added dots to create the frame. The gifts for the other two families will be posted later! 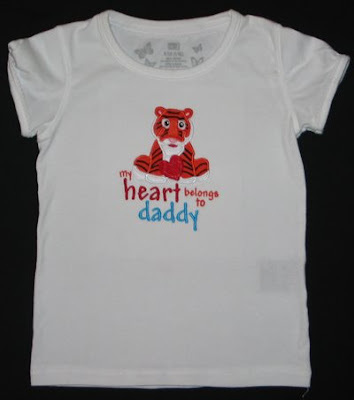 The designs originally have the text as "Baby's First..." but I wanted it personalized. While I love Embird Alphabet #8, I decided to try something different, attempting to match the character of the font Embroidery Library used for the design. I settled on the TTF Andy, and Kathy digitized it for me with Font Engine. I like the way it looks. 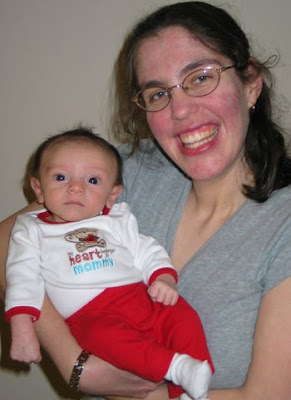 Now I need her to do St. Patrick's Day, Easter, Fourth of July... :) I guess when we get back around to Christmas and New Years, I'll have to skip the "Dashiell's First" part.